Last Thursday, my phone blew up with the news that Nestlé had secured a controlling stake in one of our legacy advisory companies, Blue Bottle Coffee, for $500 million. Dozens of our supporters reached out to offer their congratulations to ICA Fund Good Jobs, and ask what this news meant for us. I’ve taken some time to learn more about this deal and reflect on what it means for our mission to support small businesses, and create good jobs and wealth in our local economy. More than ten years ago, as volunteer with Inner City Advisors, I sat down for an advising session with Blue Bottle founder James Freeman and advisor Jim Harris, who is now the co-chair of our board and the CEO of OluKai premium footwear. I learned alongside Freeman about the power of advising, as Harris taught him about “blocking and tackling” in business, the power of cash forecasting, anticipating business challenges, and most importantly, the importance of taking care of your employees. Soon thereafter, Freeman secured a small warehouse in Emeryville, and in a subsequent advising session we gathered a collection of receipts to build an income statement. I remember advising the company through some early milestones, like assisting with permit acquisition when the company was about to open their Oakland Headquarters on Webster Street. And we are proud that we helped Blue Bottle pick the right growth equity partner to lead the company’s first round of growth capital. The Blue Bottle Roastery on Webster Street in Oakland. As I reflect on our history with Blue Bottle, what resonates with me is the dynamic potential of supporting a creative entrepreneur with real time, practical business acumen. Our entrepreneurs come to us with business insights and challenges, and we support them by meeting them where they are at. They don’t necessarily have lofty visions of $700M+ valuations, but we should never underestimate what is possible. 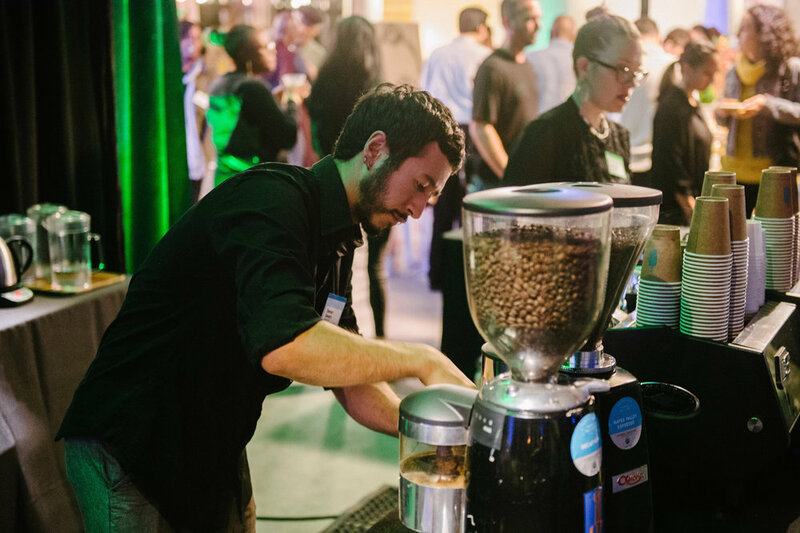 Blue Bottle Coffee at our 2014 ICA LIVE event. Never underestimate the potential of Oakland based small businesses. Think bigger. The possibilities for the high growth, high potential businesses we work with are truly endless, and we can all think bigger. The high growth small businesses we serve are not speculative. They’re proven. Too often we must explain why Oakland small businesses deserve investments of human and financial capital. Blue Bottle’s success (along with others like Revolution Foods and Back to the Roots) shows that the questions isn’t why; it’s why not? Capital is a key ingredient to our mission profit. We can do more. As an organization, we need to directly invest and participate in the financial success of the businesses we advise. Our financial returns can be recycled into our programs and investment fund, and paid forward to the next high growth businesses we serve. One thing is abundantly clear: we work with great businesses. Blue Bottle’s success is proof that Oakland entrepreneurs are bankable and creating good jobs in the Bay Area and beyond. I offer my heartfelt congratulations to James Freeman and his team, those building the company today as well as legacy employees like Katie Booser who helped fuel the company’s early growth. We look forward to working with Blue Bottle to support the next 100 small businesses in the Oakland Bay Area that are poised for exponential growth. And to our region’s entrepreneurs, we are here to meet you wherever you are at. You can access the same practical advice and support that James Freeman received during Blue Bottle’s early years by participating in our Growth Strategies course or Good Jobs Accelerator. Whether you need help securing capital, navigating permits, or drafting an income statement, we are here to serve entrepreneurs in support of our mission: creating good jobs and building equitable communities.